Keep your lawn healthy during summer and throughout the year by learning more about proper mowing, watering, pest control, and maintenance. 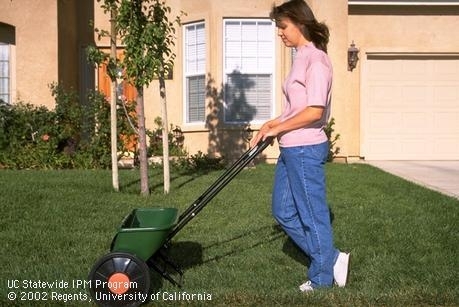 To do this, refer to the UC Guide to Healthy Lawns, an online publication specifically about lawn care. Knowing what kind of turfgrass you have can help you determine the best way to take care of it since different grass species often have different needs or pest issues. Use the Turf Species guide for identification help. Common turfgrass species that are best adapted to California conditions include Bermudagrass, Kentucky bluegrass, perennial ryegrass, St. Augustinegrass, and various fescues. Once you've identified the grass species or blend of species in your lawn, choose your location from the Schedule your Irrigation page. Then select turfgrass type followed by sprinkler output. This will show monthly irrigation recommendations based on your location in the state. In general, established lawns should be watered deeply but infrequently; two to three times per week should be sufficient. Water in the early morning when evaporation and wind are minimal. Watering in the evening can leave grass wet at night and increase the possibility of disease. Mowing grass properly means doing it the right way and using well-maintained equipment. Determine when and how frequently to mow by reading the Mowing page. Also, you may want to consider grasscycling, a method used to release nutrients back into the soil. Grass should be fertilized when it's actively growing. The When to Fertilize page recommends best application times based on your area and turfgrass species. For much more information on how to care for and maintain healthy lawns and turfgrass, visit the Established Lawns page.